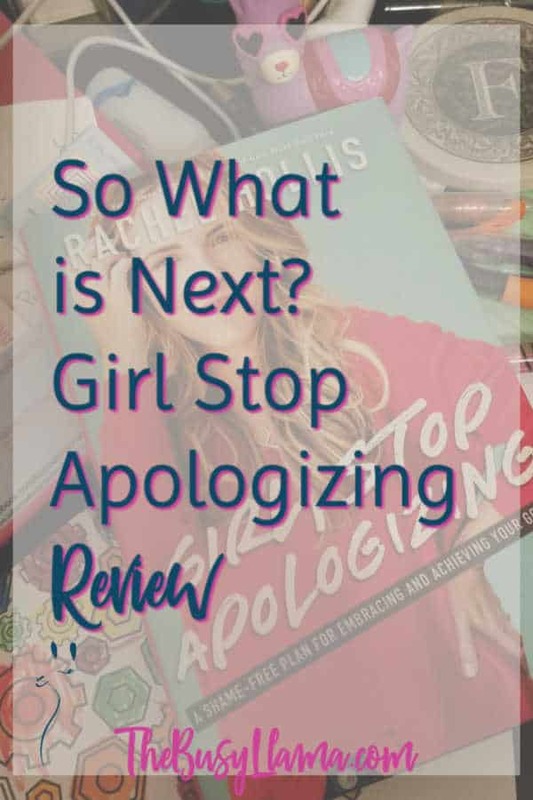 Rachel Hollis is back with the follow-up to her #1 New York Times Bestseller Girl, Wash Your Face with a blueprint to taking the next steps to be an amazing you that you have only dreamed of being: Girl, Stop Apologizing: A Shame-Free Plan for Embracing and Achieving Your Goals. Rachel Hollis is back and she is giving us the framework to be the woman we need to be, so we can be the leaders that the world needs us to be. It is basically a blueprint to stop making excuses, establish some new habits, and make a plan to achieve the dreams we continually “What if…” about daily, weekly, and for as long as we have been aware of having dreams. Women especially are so brutal on themselves and they often talk themselves out of their own dreams before they even attempt them. So, was her dream well executed? Read along to find out! Similar to Girl, Wash Your Face; the chapters are pretty short, sweet, and to the point. The book is broken out into three main categories; Part I: Excuses to let go of, Part II: Behaviors to adopt, Part III: Skills to acquire. Each part is then broken down into the excuses, behaviors, and skills you need to get over, embrace, and acquire to help you achieve your big, scary dreams. She also includes an introduction and conclusion to help ease you in and clean up the loose ends. It is one thing to have dreams, it is another thing to actually take the time and lay out the plan to achieve them. Ms. Hollis puts forth a lot of “What ifs…” to get you thinking about making the leap. And once she gets around to Part III, helps by giving you a strategy to make those dreams a reality without setting an expiration date for those dreams. Don’t you dare listen when someone tells you that you need to have an end date. I respectfully disagree with Ms. Hollis on the dislike of the “T” from SMART goals. I think an element of time-bound is necessary for some of the stepping stones on the way to a BIG goal or dream. Are you a failure if you don’t reach them by concrete, set-in-stone dates? No, but some of us need that time-bound aspect to our dreams. However, I do like the concept of kicking the to-do-list to the curb and replacing it with a daily results list. That is much more effective, along with her suggestion to limit it to just five items. This book seems very rushed, and at points contradictory to Girl, Wash Your Face. I strongly feel that it needs to be re-edited. Ms. Hollis even acknowledges that she wrote some of the content in a rushed manner, and it certainly shows. An additional area for improvement would be a bit less repetition. A lot of the same elements from Girl, Wash Your Face appear in the book. Especially in Part I. Maybe some key parts but not the whole book. Part III has some pretty sound advice for helping to keep you focused and establish a real plan to get you to goals and dreams. If our daughters don’t see a daily practice of us feeling not only comfortable but truly fulfilled by the choice to be utterly ourselves, how will they learn that behavior? As for that quote, I can 100% get on board with what Ms. Hollis has to say. I am doing my damnedest to continue to do what I love and love what I do so that my daughter has a great example. Do you do that? I hope I have inspired you to pick up a copy of Girl, Stop Apologizing: A Shame-Free Plan for Embracing and Achieving Your Goals so that you can form your own opinion. I would love to hear your feedback and continue the discussion on it. Drop me a line or join The Busy Llama community to be a part of the discussion.